Everell Stanton (E.S.) 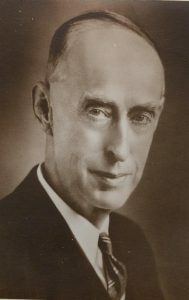 Collins was an American lumberman and Methodist laymen who at this death in 1940 left the income from vast forest tracks in Pennsylvania and California to the Methodist Board of Foreign Missions; today, the Collins Forest income provides health and retirement benefits for qualified missionaries who serve through the United Methodist General Board of Global Ministries, a successor to the Board of Foreign Missions. As a boy and a young man, E.S. worked in his father’s mills and forests in the Tionesta Valley of Pennsylvania. At thirteen, he’d already spent winters in sub-zero temperatures hauling timbers out of frozen creeks. At fifteen, he was working in the mill jacking logs and edging. By eighteen, he was running the mill. In between, he’d taught himself the skills of an engineer and patented a pocketful of sawmill inventions. His formal education included the school in Beaver Valley, Pennsylvania, then onto Carrier Seminary in Clarion, Pennsylvania, and finally, one year at Allegheny College. That one year came to an abrupt end when he had to withdraw because of chronic coughs and colds referred to then as consumption. When he wasn’t working in the mill, the forest, or going to school, he was avidly attending services in the Methodist Church and taking in revival meetings that came through the area. There was, of course, always time to be a boy – hunting squirrels, ducks, grouse, woodchucks, and rattlesnakes; fishing for trout; cutting beehives from trees; hiking, swimming, and berry picking. Heeding the advice of Horace Greeley to “go west young man,” Collins explored timber options in several areas and came to focus on the Pacific Northwest and Northern California. His Methodism went with him. He developed a major, family-owned company, headquartered in Portland, Oregon, that would come to stress good stewardship in the use of land and forest. He also built a fortune, using much of it for philanthropic purposes. He is remembered, as an editorial in the Oregon Journal said on January 1, 1941, as “shy, serious, disciplined, intelligent…He acquired a life of meaning and purpose.” E.S. Collins and his wife, Mary Laffey, had three children. The income streams from the original land and trusts were consolidated over the years to provide support for missionary health and retirement benefits programs. The annual revenue depends on the harvest. Narrative by Elliott Wright, drawing form Collins, Global Ministries, and public media sources.